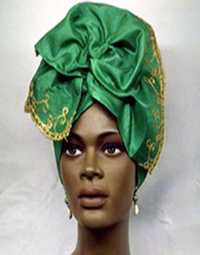 Gele Headwrapping on DVD documentary concept is designed to ease the preparation of headwrapping styles on a daily basis. 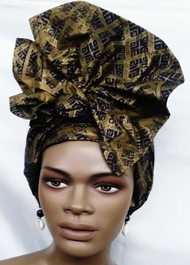 This Vidoe include six easy to learn headwrapping styles, couple with traditional African flute song and drum music that will please your soul. Perfect for the whole family and gifts. 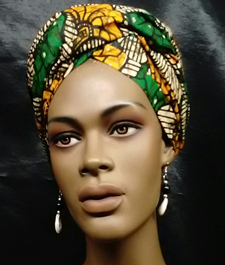 African Elegant Green Embroidered Headwrap- Elegant way to show off your heritage. Perfect for any occasion. 2 Yards in Length. 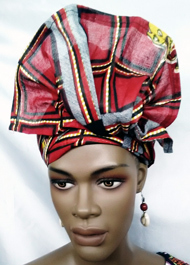 African Head Wrap- African Red Print Head Wrap- Elegant way to show off your heritage. Perfect for any occasion. 2 Yards in Length. 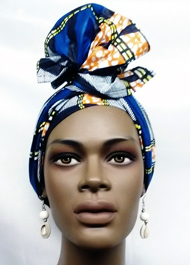 African Head Wrap- African Navy Blue Gold Head Wrap- Elegant way to show off your heritage. Perfect for any occasion. 2 Yards in Length. 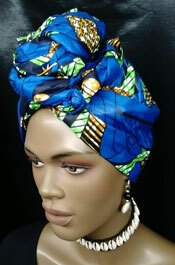 African Head Wrap- African Blue Print Head Wrap- Elegant way to show off your heritage. Perfect for any occasion. 2 Yards in Length. 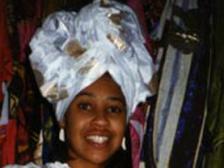 African Gele Head wrap. 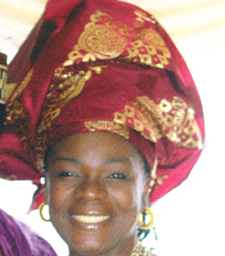 Ghana and Nigeria style gele! Free pre-wrap available. 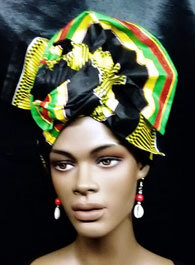 Perfect for bridal and formal occasions Avialable in all George colors: Red and Gold, Purple and Gold, Blue and Gold, White and Gold, Black and Gold, Cream and Gold and Fusha and Gold colors. Free shipping and Handling. Elegant way to show off your heritage. Perfect for any occasion. 2 Yards in Length. 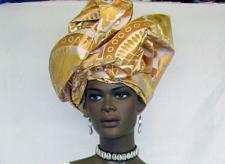 African Silver Orange Head Wrap- Elegant way to show off your heritage. Perfect for any occasion. 2 Yards in Length. 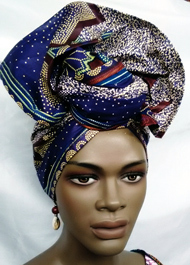 African Head Wrap- African Purple Star Print Head Wrap- Elegant way to show off your heritage. Perfect for any occasion. 2 Yards in Length. 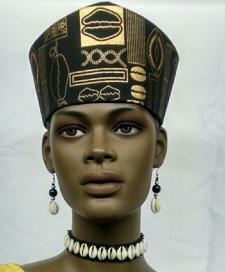 Elegant open top African Women Crown or hat for women with velcro closure for perfect fitting. 100% cotton mudcloth fabric. Perfect for all occasions and gift items. Available in all colors million stones george fabrics. Made by Wilsdom Designs. Please select your fitted hat size. 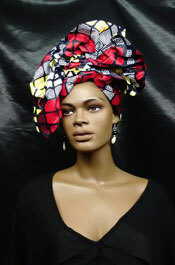 African Print Gele Head wrap- Elegant way to show off your heritage. Perfect for any occasion. 2 Yards in Length. 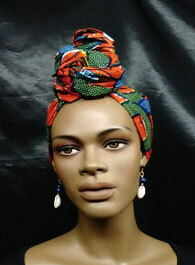 African Orange Print Knotted Head Wrap- Elegant way to show off your heritage. Perfect for any occasion. 2 Yards in Length. 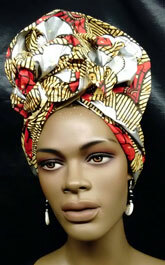 African Head Wrap- Elegant way to show off your heritage. Perfect for any occasion. 2 Yards in Length. 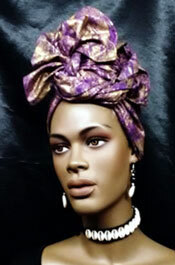 African Purple/Gold Head Wrap. Elegant way to show off your heritage. Perfect for any occasion. 2 Yards in Length. 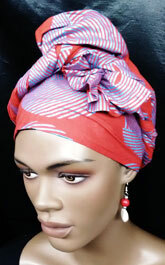 African Red Purple Print Head Wrap- Elegant way to show off your heritage. Perfect for any occasion. 2 Yards in Length. 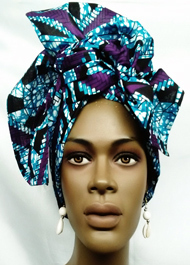 African Head Wrap- African African Teal Purple Head Wrap- Elegant way to show off your heritage. Perfect for any occasion. 2 Yards in Length.